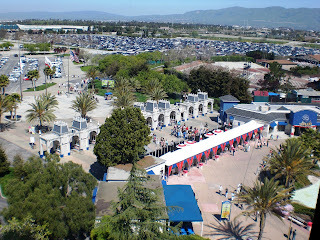 Lockheed Martin had its Family Day at California's Great America on Saturday. This was particularly special because the park didn't technically open for the season until the next day. This meant two things: 1) we were excited because we'd been wanting to go, and didn't realize there was a "season" for the theme park, and 2) they were using us as the "dry run." It became clear that they weren't at full-staff, and many of the rides weren't ready to be launched for the season. But, more on that later. And by later, I mean sometime this week, since this will probably be several parts. First, a mini-lesson. This is NOT the same as Six Flags - Great America. In fact, this Great America was built by Marriott, as was the theme park in Illinois that became Six Flags - Great America. It was built in 1976, but Marriott sold it (ours here) to the city of Santa Clara in 1985 (there was a failed sale in 1983 as well). In 1989, the city partly sold the park to Kings Entertainment Company. Then in '92, Paramount bought the park. 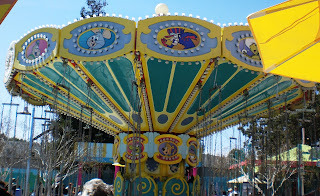 When Nickelodeon bought out Paramount in 1994, the Nickelodeon part of the park was born (I still am unclear on how the Hanna Barbera characters came to be part of the park as well...). Apparently the park stopped looking like Marriott's original design at this point, since they tore down the Ferris Wheel and Train Ride. 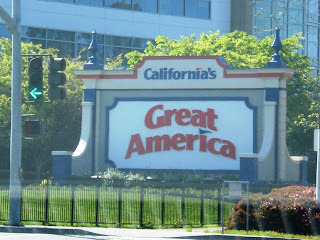 In 2006, Cedar Fair bought the property (and the other Paramount Parks), and renamed it California's Great America. The park opened at 10am (I know, what!?! ), and we got there at 10:30 (it's all of a ten-minute drive from our place). We strolled right on in, with security being higher than FL parks, but not bad (they did have you go through a metal detector, after first passing cell phones/cameras/keys through in a bowl). We had only taken a brief look at the map before arrival, but weren't too concerned. 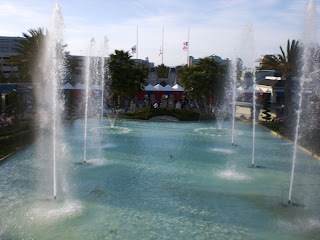 I should mention here that in FL, theme parks are practically an art. As in, you systematically work your way through, and back-tracking is quite limited. Here, that didn't really work, so we ended up walking the length of the park a good five times. We started off with Vortex, one of their roller coasters. The line wasn't too long, and it was early yet. While in line, we were observing an extreme amount of baggage being carried by other patrons. Not extreme like duffle bags, but extreme like almost everyone was carrying a bag! In FL, that would never happen. Maybe 1 bag per 5 people, but still, bags aren't very utilized there. As we pondered how that would work on a ride, we got closer to the actual coaster. We realized the riders were STANDING UP. Well, this'll be new! As we got closer, we saw that there were cubbies set aside for riders to leave their bags. Not the most secure way to go, but since they were only running one train at a time, and the cubby was on the "exit side" of the ride, theoretically nobody would go by there until you returned. Of course, this means you have to climb all the way cross the ride, then put your stuff in the cubby, and then reload into the ride. But, it worked for the park. However, they didn't have a worker regulating those waiting in line into rows in preparation to board. No lie, I took over and pointed some people into a row that nobody was waiting in (this would be a trend throughout the park, but we'll get to that). Anyway, the group before us had technical difficulties, and they had to lock and re-lock the restraints about five times. What seems to cause the problem: you have to stand straight up so when it comes down and locks, you're set. Some people were squatting or tip-toeing, and that wasn't going to work. Finally, the workers came to realize that they need to say "restraints will be locking in three seconds" or something similar. We boarded, got locked in, and were off! It was a pretty different ride from a standing-up perspective. It would have been neat to be in the front row for this one! It was a pretty short ride, less than 90 seconds I'm sure, but was worth the 30 minutes or so we had to wait. Jonathan didn't care for it quite as much as I did. 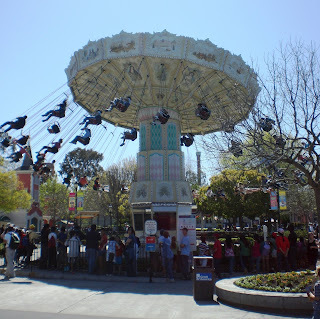 The pic below is of the swings (that we didn't go on), I liked the design.